Going on a trip together. The whole family, brothers and sisters and all the boyfriends and girlfriends. Or maybe you are looking for something active to do with your colleagues? Teamwork, training and relaxing. Any kind of group you would like to travel with for a weekend, week or maybe just a day, the crew of the Tecla will try and make your wishes come true and get the most out of your voyage on board. Go on an adventure together. Explore the world while sailing with your holiday home. This way you can share your unique experience with the ones closest too you. So dare your friends to do something extreem for a change. Dare everybody! Go sailing on board an ocean going sailing vessel. Contact us to see what is possible. In 2017 we will return to Iceland and maybe even visit Greenland. Would you like to join us there with your group (up to 12 people) contact us now and we can plan your perfect holiday! Imagine yourself coming on board for the first evening with all your friends. First get to know the ship, then explore the town. Next morning you set your first sails. This is a strength match waiting to happen. Who can keep up the longest. Who can take the best picture? And then the first night watch. A cool and exciting experience for everybody. Everything is dark. Your friends in the previous watch have made you some good, real ships coffee, strong and hot. They offer you a big mug while you eyes are adjusting to the darkness around you. And slowly more and more specks off light appear, stars, other ships, maybe a lighthouse or a buoy. And then the watch handover. The off going watch tells you their story of the night, what did they do, what did they adjust and what course are they steering. You and your watch mates take over the helm and your friends can go back to bed for a few hours of sleep. During your watch you will be busy trimming the sails, steering, standing on the lookout and learning about navigating the Tecla. The night watch is by far the best moment to share some tough stories. And the Tecla crew will be happy to join in, stories on the biggest wave, the coldest night, the best harbour or some foreign bar stories. And when the Tecla arrives in one of the harbours, it is time for a well deserved drink. A good moment to see everybody together and exchange experiences. After that, maybe a hot shower and off to the shore to explore some more. If you can relate to this story, if you think your friends or family are up for such an adventure. Then now is the time to start organizing and contact us for more information. Together with you the Tecla crew would love to make a plan for your perfect voyage. You can join us during one of the voyages that are already online. For any of those voyages we will give you a discount of 15% if you book with a group of 12 persons or more (book before Januari 2015 and you will get 25% discount as an early bird!) Or at the end of the season, in September, we can make some new plans just for you. You can organize food and drinks yourself, or we can provide you with a cook and a menu. The Tecla is equipped to make a sailing holiday possible for almost everybody. All ages, all levels of experience. 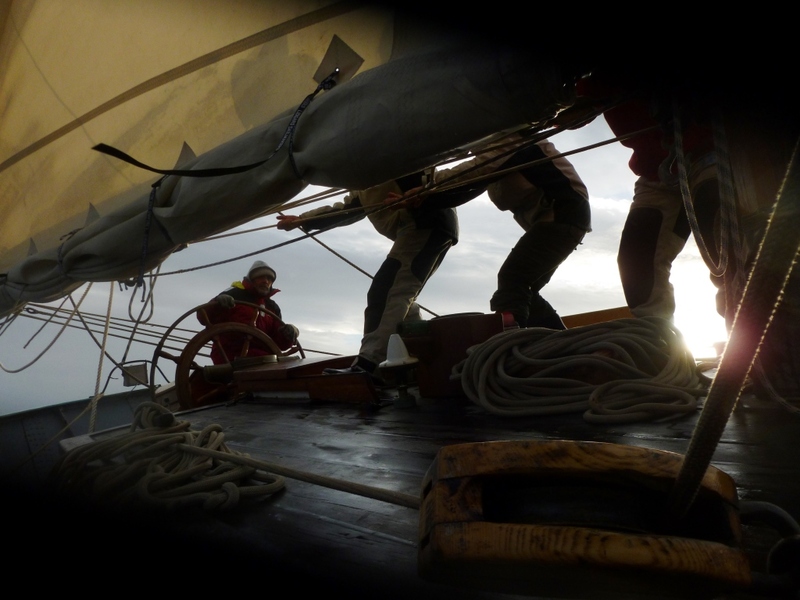 Together with you we can determine how adventurous we should make the voyage, also taking in account weather and wind. Would you like to charter the vessel during the summer season, please let us know early so we can reserve the whole ship for you. Would you like to go sailing for a weekend or a week in the spring or autumn, let us know and we will make a custom-made plan with you.